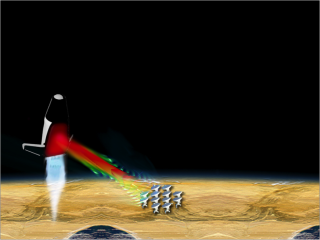 A conceptual microwave-propelled lightcraft receives microwave beams from an array of microwave sources on the ground. Space launches have evoked the same image for decades: bright orange flames exploding beneath a rocket as it lifts, hovers and takes off into the sky. But an alternative propulsion system proposed by some researchers could change that vision. Instead of explosive chemical reactions onboard a rocket, the new concept, called beamed thermal propulsion, involves propelling a rocket by shining laser light or microwaves at it from the ground. The technology would make possible a reusable single-stage rocket that has two to five times more payload space than conventional rockets, which would cut the cost of sending payloads into low-Earth orbit. NASA is now conducting a study to examine the possibility of using beamed energy propulsion for space launches. The study is expected to conclude by March 2011. In a traditional chemical rocket propulsion system, fuel and oxidizer are pumped into the combustion chamber under high pressure and burnt, which creates exhaust gases that are ejected down from a nozzle at high velocity, thrusting the rocket upwards. A beamed thermal propulsion system would involve focusing microwave or laser beams on a heat exchanger aboard the rocket. The heat exchanger would transfer the radiation's energy to the liquid propellant, most likely hydrogen, converting it into a hot gas that is pushed out of the nozzle. "The basic idea is to build rockets that leave their energy source on the ground," says Jordin Kare, president of Kare Technical Consulting, who developed the laser thermal launch system concept in 1991. "You transmit the energy from the ground to the vehicle." With the beam shining on the vehicle continually, it would take 8 to 10 minutes for a laser to put a craft into orbit, while microwaves would do the trick in 3 to 4 minutes. The vehicle would have to be designed without shiny surfaces that could reflect dangerous beams, and aircraft and satellites would have to be kept out of the beam's path. Any launch system would be built in high-altitude desert areas, so danger to wildlife shouldn't be a concern, Kare says. Thermal propulsion vehicles would be safer than chemical rockets since they can't explode and don't drop off pieces as they fly. They are also smaller and lighter because most of the complexity is on the ground, which makes them easier and cheaper to launch. "People can launch small satellites for education, science experiments, engineering tests, etc. whenever they want, instead of having to wait for a chance to share a ride with a large satellite," Kare says. Another cost advantage comes from larger payload space. While conventional propulsion systems are limited by the amount of chemical energy in the propellant that's released by combustion, in beamed systems you can add more energy externally. That means a spacecraft can gain a certain momentum using less than half the amount of propellant of a conventional system, allowing more room for the payload. "Usually in a conventional rocket you have to have three stages with a payload fraction of three percent overall," says Kevin Parkin, leader of the Microwave Thermal Rocket project at the NASA Ames Research Center. "This propulsion system will be single stage with a payload fraction of five to fifteen percent." Laser propelled spacecraft would be small, simple and expendable with the complicated launch system on the ground. Having a higher payload space along with a reusable rocket could make beamed thermal propulsion a low-cost way to get material into low Earth orbit, Parkin says. Parkin developed the idea of microwave thermal propulsion in 2001 and described a laboratory prototype in his 2006 Ph.D. thesis. A practical real-world system should be possible to build now because microwave sources called gyrotrons have transformed in the last five decades, he says. One megawatt devices are now on the market for about a million U.S. dollars. "They're going up in power and down in cost by orders of magnitude over the last few decades," he says. "We've reached a point where you can combine about a hundred and make a launch system." Meanwhile, the biggest obstacle to using lasers to beam energy has been the misconception that it would require a very large, expensive laser, Kare says. But you could buy commercially available lasers that fit on a shipping container and build an array of a few hundred. "Each would have its own telescope and pointing system," he says. "The array would cover an area about the size of a golf course." The smallest real laser launch system would have 25 to 100 megawatts of power while a microwave system would have 100 to 200 megawatts. Building such an array would be expensive, says Kare, although similar to or even less expensive than developing and testing a chemical rocket. The system would make most economic sense if it was used for at least a few hundred launches a year. In addition, says Parkin, "the main components of the beam facility should last for well over ten thousand hours of operation, typical of this class of hardware, so the savings can more than repay the initial cost." In the near term, beamed energy propulsion would be useful for putting microsatellites into low Earth orbit, for altitude changes or for slowing down spacecraft as they descend to Earth. But the technology could in the future be used to send missions to the Moon or to other planets and for space tourism. Kare has looked into the possibility of using lasers to propel interstellar probes for NASA's Institute of Advanced Concepts. A deep space launch would require higher power lasers with larger telescope systems as well as laser relay stations in space. Powering missions over interplanetary distance would require even bigger lasers and telescopes, as well as different propulsion techniques using propellants easier to store than liquid hydrogen. Sending a spacecraft to a moon of Jupiter, for instance, would require a laser that gives billions of watts of power. "You'd have to have another couple generations of space-based telescopes to do something like that," Kare says. "You can in fact launch an interstellar probe that way but now you're talking about lasers that might be hundreds of billions of Watts of power." Laser technology could reach those levels in another 50 years, he says.